I can’t stop making these lentil burgers. These burgers come together quickly, are delicious, and everyone who eats one wants more. Lentils, mushrooms, eggs. Assorted toppings. Buns. I usually have all these ingredients in the kitchen, so am ready to go. 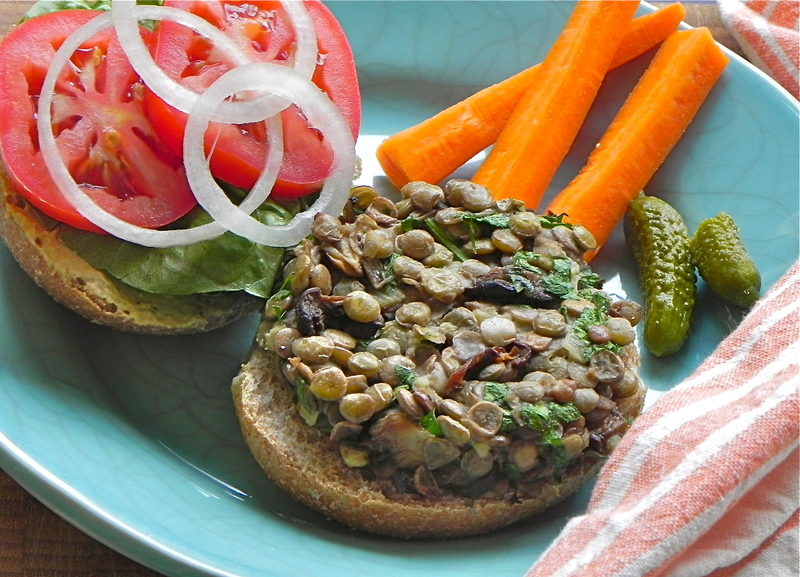 If this sounds familiar, it may be; I posted about lentil-mushroom burgers in January. But like I said, I can’t stop making them. And eating the leftovers, if there are any, for lunch. Most times, any extras get packed in somebody’s lunch. Lucky one, he (or she) who eats these a second day. While the lentils cook, chop the mushrooms and onion, and bake. As all the veggies are cooking, beat the eggs with the parsley; and set the table. Then, when the patties bake there’s just enough time to collect the condiments, put out lettuce, tomato, and onion, and pour drinks. The lentils pack a lot of protein and the eggs help, too, so you won’t leave the table feeling hungry without having had meat on your plate. And the roasted mushroom-onion mix takes care of big flavour. Add some sauce and you’re all set… Meatless Monday anyone? Rinse the lentils; put in a pot, cover by 1 inch of water and bring to a boil. Simmer, covered, for 15-20 minutes: lentils should be cooked through but not mushy. Drain in a sieve and set aside until all the ingredients for the patties are ready. Meanwhile, toss the mushrooms and onions with the oil and spread on a small baking tray. Bake at 400F for 10 minutes. Beat the egg, egg white, parsley, salt and pepper. Combine the cooked lentils, and cooked mushrooms and onions with the egg mixture and stir gently to mix everything well. It will be a wet mixture, but don’t worry. Don’t be tempted to add breadcrumbs or oats or other dry filler. Using a 1/3 cup meaning cup, scoop the mixture onto a parchment-lined baking pan and press lightly to make a patty shape rather than a mound. This mixture yields 8 patties. Bake at 400F for 10 minutes. Serve immediately on sliced buns with lettuce, tomato slices and mustard, or other toppings of your choice. (I like curry mayo and alfalfa sprouts on mine). These can also be served in Boston lettuce ‘cups’ in place of rolls. I like them with grainy mustard, too. But especially with salsa verde or curry mayo! I love lentils! Definitely trying this recipe! Thank you! I hope it works out for you – everyone seems to love these burgers once they try them. Thanks, I hope you like them. It would take some convincing to get my loved ones to try these- I’m sure great flavors can win over skeptics! Thanks for linking up today, I can’t wait to see what you’ve got for us next week!